90+ specs for your fleet in seconds. Enter one or multiple VIN numbers and instantly return valuable information about your vehicles to store in Fleetio, saving you countless hours of data entry. Powered by DataOne. *This feature is available on passenger, light, medium and heavy duty vehicles made in North America or manufactured for sale in North America. VIN decoding for Heavy Duty vehicles is supported for model year 1995 and newer. 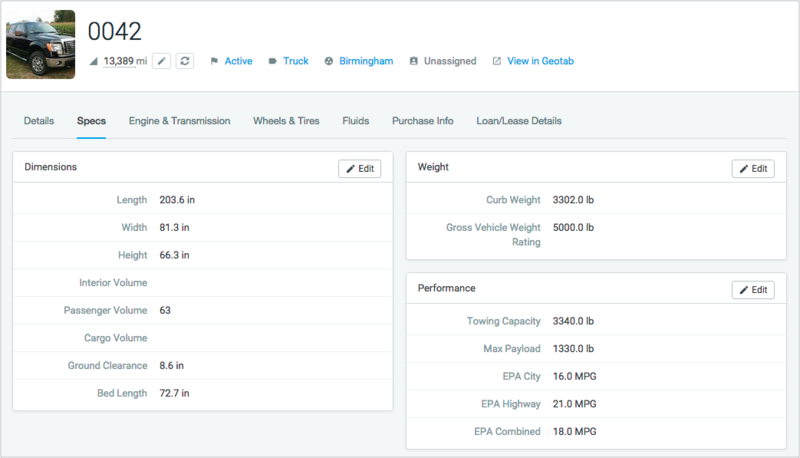 I am thrilled that Fleetio populates the tire sizes [and more] for vehicles. I have spent more than three hours logging tire sizes on my vehicles as they come in for parts. It makes me jump for joy that I will never have to do that again!